The past couple of years have been quite busy for the Rs 20-30 lakh SUV segment. We've had the Rexton, CR-V, Yeti and the Santa Fe all come in new or refreshed forms. And all this while the segment king, the Fortuner was sitting idly by, but Toyota have finally woken up and decided to do something about it. In a better-late-than-never move, they've finally given the top end 3.0-litre 4WD variant an automatic gearbox so you can finally have a capable Fortuner without having to change gears yourself. Enough to keep the big Toyota relevant in a sea of modern competition? Let's see. Toyota have given the big Fortuner some small visual tweaks including slightly smoked out head and tail lamps in addition to giving the fog lamps chrome bezels. The overall look is completed by new 12-spoke dark grey alloy wheels that, coupled with the new Mica Grey colour, give the Fortuner a particularly menacing presence on the road. As if it wasn't already one of those vehicles that make road users scurry out of its way. The interiors are familiar but are now in an all black theme with a little wood garnish on the dash and door pads adding some class. The look is simple and rather dated but Toyota makes up for it by making sure there are plenty of creature comforts. This, being a top end model, gets cruise control, auto xenon headlamps with washers, a reverse camera, power adjustable driver's seat and a new touchscreen infotainment/navigation unit that now features voice control. However, the unit looks like an aftermarket add on and is also a little slow to respond. Nevertheless it offers comprehensive connectivity options including AUX, USB and Bluetooth. The seats are comfortable, there's lots of space in the middle row and with the bearably spacious third row folded up, you have access to a massive storage area. 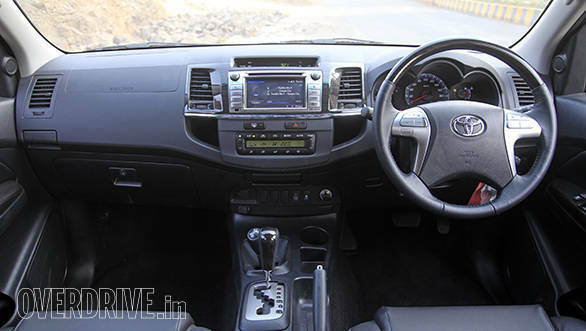 Boring looks aside, the Fortuner interior makes sure you're comfortable and you don't really feel wanting for any features. The 3.0-litre engine carries over unchanged and produces the same 171PS and 343Nm. The engine is smooth, punchy and not too clattery but it's still quite loud inside the cabin. 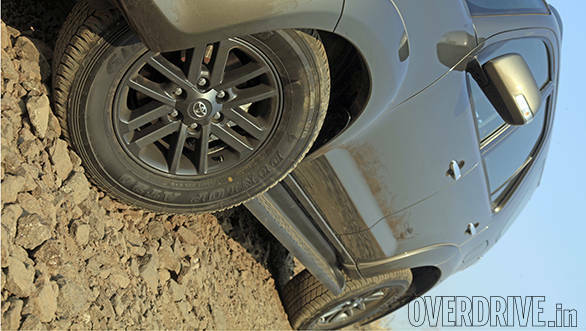 What's new is the 5-speed torque converter that is similar to the one in the 4x2 variant. It's an old school box with a slushy feel that results in complete smoothness and reasonable response times. 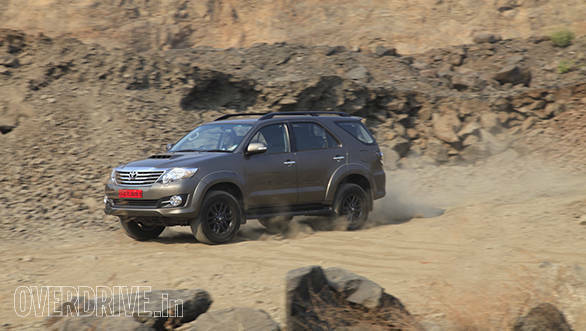 It doesn't generate instant response but that's not what the big and soft Fortuner is about. The gearbox adds about 30kg to the Fortuner's weight but performance is very similar to what we got on the automatic 4x2 variant with a sub-12s run to 100kmph and a top speed just short of 180kmph. 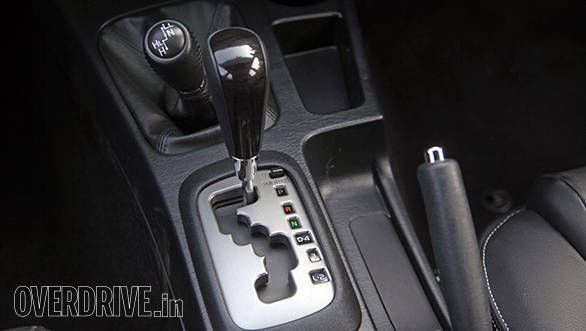 The gearbox doesn't give you the option of manually shift but you can hold on to fourth, third or second gear, depending on the requirement. It's not ultra modern but its is effective and perfectly matches the Fortuner's nature of being a brisk but unhurried SUV that's much happier cruising at high speeds than trying to set acceleration times. Fuel efficiency is again quite close to its rear wheel driven sibling and the overall figure of 11.7kmpl is fair for a vehicle of this size. Plus the 80-litre fuel tank will see long gaps between visits to the fuel station and easily achievable 1000+km highway stints. Dynamically not much has changed. The car feels soft, irons out most bumps and overall ride is quite comfortable. The steering is hefty but not overly so and the commanding driving position makes it easy to manoeuvre this behemoth in traffic. High speed behaviour is rock solid and the brakes offer very smooth and progressive performance. Off-road capability is still superb as you have an option of a low ratio gearbox but its not a shift on the fly unit. The Fortuner may be old but she still holds her own in the company of newer rivals. It is still one of the most capable ladder frame based off-roaders you can have at this price (Mitsubishi/HML isn't doing much with the Pajero Sport) and now offers the convenience of an automatic. If you place capability over design but still want your creature comforts then the Fortuner is still seriously worth a look. It's not cheap but it's also not the most expensive in the segment (we're looking at you Santa Fe). 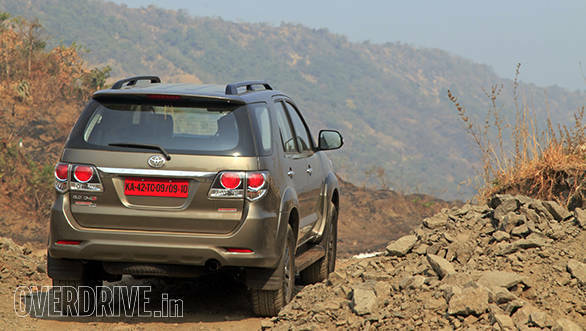 Overall, the Fortuner still remains a unique proposition in a sea of soft roaders and that should be enough to tide it till the next generation arrives in 2016.